A ** denotes a series class. Please contact presenters directly to register for these. All other classes are ongoing and open for drop-in. Please join us any time! This moderately-paced yoga class includes gentle warm-ups with a focus on internal alignment as well as still and movement-based postures to promote strength, balanced flexibility, and easeful and intelligent movement choices. As with all of our yoga classes, the session ends with a cool down and savasana. 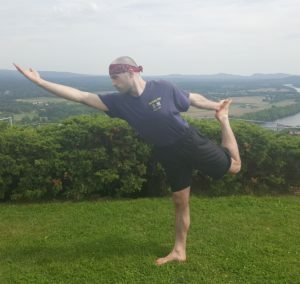 While interpretations of Kripalu Yoga vary, ours acknowledges and fosters the interconnection of the systems of breath, mind, and body and encourages self-compassion, deep attention, and wise and grounded action both on and off the mat. This class is suitable for a wide-range of levels and abilities. Originally created for school teachers looking to unwind at the end of the school-day, this Monday afternoon series is open to anyone interested in gentle practice. Class includes an opening meditation, warm-ups, gentle posture flow, seated postures, and savasana. It is gently strengthening, deeply relaxing, and accessible to a range of levels. Drop-ins are welcome, but please note that we don't meet on Monday holidays or school vacations. If you're not signed up for the series, do check the schedule for current class information. The current series runs throughout the winter and spring with the exception of holidays. 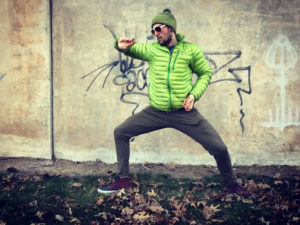 YogaFitness combines yoga with contemporary fitness techniques to help promote strength and flexibility. This class explores yoga postures while utilizing props and weights to create a fun and balanced workout. Get ready to feel rejuvenated after this hour long practice with an emphasis on strengthening and toning specific muscle groups. YogaFitness is suitable for all levels and ages, and every movement can be modified to help meet your individual needs. Yin Yoga is a physically gentle practice that emphasizes stillness, internal balance, and deep focus. 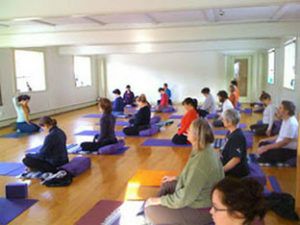 We hold simple postures for three to five minutes, not with the sole intention of becoming more flexible (though this may occur as a result) but also in order to organize, strengthen, and moisten the tissues of the body through the application of gentle lines of force or "stretch" in a range of seated and reclining yoga postures. This can lead to more efficient and easeful movement, greater awareness, and the release of tension or held patterns as the energetic and physical bodies move toward a more harmonious alignment. It is suitable for beginners, but is also ideal for advanced practitioners looking to explore the realms of deep focus and attention. It is easy to adapt for special conditions due to its slower pace, and students of all levels have reported a sense of calm and clarity at the completion of practice. For intermediate and advanced students. This moderately-paced vinyasa practice includes a warm-up with core conditioning, traditional and exploratory posture flows, and balancing and seated postures with an emphasis on intelligent and functional movement choices, skillful awareness, and whole-being integration. This class addresses repetitive strain injuries common in long-time vinyasa yoga practitioners and some strategies to help prevent and alleviate them. Vinyasa Yoga is open to anyone with previous experience interested in exploring a stronger practice, and, as always, you are invited to adapt the offerings to meet your individual needs and circumstances. Suitable for a range of levels, this class focuses on isolated movements to release inefficient patterning or chronic tension. The class includes lengthening and decompressing the spine through stances and breathing as well as neurological re-patterning. It addresses rotational imbalances in the shoulders and hips and encourages the skills and awareness needed to successfully navigate the forces of gravity that impact the body. Expect a mindful hour of systematically awakening the joints, finding freedom and fluidity, expanding into full range of motion, and working with isometric strengthening. The goal is a strong, healthy body and a balanced energy system. By bringing focused awareness and calm observation of sensation, the patterns of held tension are invited to resolve, resulting in a new level of fitness, strength, stamina, spaciousness, and overall well being. In this ongoing class, we will learn and practice a simplified Tai Chi form designed for ease of learning and safety of practice. We are practicing a modified Sun Style that is design to get at the core health benefits of Tai Chi and be simple and fun to learn. Join us anytime and at any level. No previous experience is necessary. Contact Steven at showland@me.com to register or for more information. A balancing, strengthening, and rejuvenating yoga class for a range of experience levels, Slow Flow Yoga combines moderately paced posture flow and seated posture work with some yin postures and gentle movements for a strengthening, balancing, and calming yoga experience. Open to all levels. A gentle class for all levels, this class explores the subtle power of breath and awareness aligned with easeful and purposeful movements and postures. 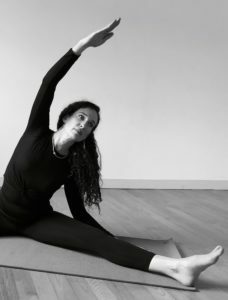 A great way to balance a more vigorous practice or to calm the system at the end of the week, this class offers a range of options and modifications to help you tailor the practice to meet your needs and goals. Enjoy calming music, warming and restorative postures, and a long integration, all intended to foster a healthy mobility and greater ease and vitality in body and mind. 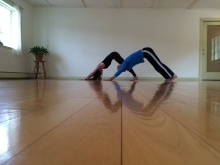 A gently strengthening and balancing community class each Friday. Class is only $5.00 for Franklin Community Co-op members (McCusker’s and Greenfield’s market), $10 for non-members. 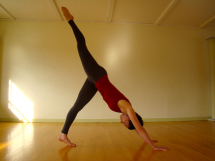 Come enjoy a mid-day practice and meet the teachers at Shelburne Falls Yoga. Start your weekend off well with this smartly-sequenced, quietly vigorous vinyasa class designed to cultivate your inner strength, both physical and spiritual. Expect core work, vinyasa flow with options for a range of levels, and a focus on aligning breath with movement to help establish and maintain a fun, safe, and sustainable practice. 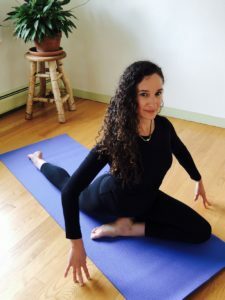 Kate believes a yoga practice can be, and should be, accessible to yogis of all body types, genders, races, and physical abilities - all are welcome in Kate's classes. Start your day with this moderately paced yoga flow class, open to practitioners of all levels of experience and ability. Through the mindful integration of physical yoga postures, breath, and attention / intention we cultivate a well-rounded combination of strength, flexibility, kindness, curiosity, integrity, and grace. We move slowly and deliberately (and with a healthy dose of humor too!) in order to deepen awareness and fully embody the breath, the postures, and ourselves, a practice that can also help us move through life with greater clarity, ease, and efficiency.